As a director, I have an affinity for dark comedy and enjoy the challenge of staging in unconventional spaces. But more importantly, I am interested developing new work, bringing new meaning to published texts, and creating opportunities in the theatre for underepresented groups. My body of work includes short plays, cabarets, and, most recently, an original two act musical. Evelyn is an original musical written and composed by Quenton Ellis. Based on the iconic photograph, "The Most Beautiful Suicide," the show chronicles a fictionalized rendering of Evelyn McHale's young adult life. 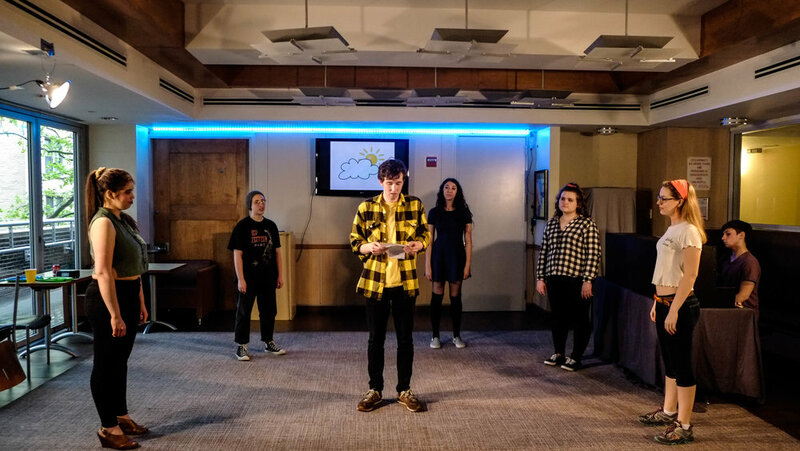 I joined the project as the director in January, 2018, and staged the first workshop production at Marymount Manhattan College. I then directed the musical a second time in November, 2018 at Dixon Place in NYC. Cell, by Cassandra Medley, follows the story of three African American women living in Flint, Michigan who work for an illegal immigration detention center. Tensions rise when the youngest, Gwen, begins to question the ethics of the institution that her aunt has been working for for over twenty years. I directed this play my senior year of college for my final directing class. Dog Sees God: Confessions of a Teenage Blockhead by Bert V. Royal follows the beloved Peanuts gang from Charlie Brown to high school, where their lives have become plagued by peer pressure and insecurities. This production was staged in my college’s dining hall, using minimal tech and architecture.